I found another facebook fan page that took my art and made it it’s own by plastering their stupid logo all over my pictures without even asking for permission or giving me credit or even have the decency to redirect people to my website, I’ve already sent a message to the woman managing the page, she just replied and I forced her to take them down even though she was trying to convince me to leave them because people liked them. It makes me angry that every day I see another website or page that takes artists fan art or work make it their own property and seeing that these people did it to me makes me feel violated, I have tried contacting the owners of fanart in the past, I’ve never really followed up on whether they did remove their art or at least given them credit but I at least warn people, it’s up to them if want to take action or not. I would have not had a single problem if they had not tampered with my pictures and given me credit with a link to redirect people to the site where they got it. Her response to that was “well your work is really beautiful and you should be happy to be promoted on a big page” well, yes and no, the problem with these actions is that you download a photo from an artist’s website, you add your logo (making it yours that way whether you intend it or not), uploading it to your website or facebook and just saying “Isn’t this pretty?” and wait for people to comment. No link, no credit, not even a mention of the artist, all those visits, all those comments and likes are for the person that uploaded that picture to their website, not a single person ever gets in touch with the artist and the artist never knows and realizes that people have seen their work somewhere else, who wins? not the artist, but the thief managing the page, he gets more likes and comments that would have gone to the artist. If you think that by taking a picture from google entitles you to own it, you’re wrong, that picture, that art and work has an owner, and I’ve have been guilty of doing it many many years ago with anime wallpapers when I first started watching anime, but a few years ago I realized that if you’re going to take someone’s work and display it just to show other people how cool it is, then give credit to the artist, place a link to their work and above all, ask for permission to use their material on your site. 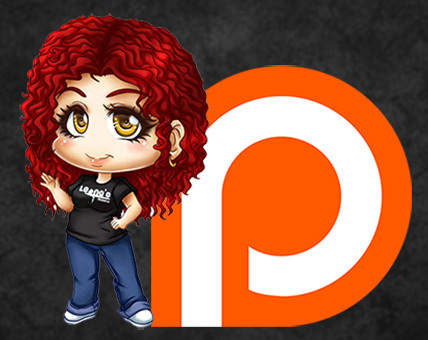 It’s impossible for me to have eyes all over the internet, but I do have you guys to help me. If you ever see my pictures from my work, anywhere on the web where it’s not on any of my official pages, report it if possible and let me know so I can take legal action if needed because I will only authorize use of my work if and only if a person asks me permission to do it. EL dia de hoy me encontre una pagina de facebook donde el administrador tomo mis fotos de mi trabajo y las modifico poniendole el logo de ellos seguido del mio, no me dieron ni credito, ni le pusieron un link a mi pagina ni mucho menos me pidieron permiso para usarlas. 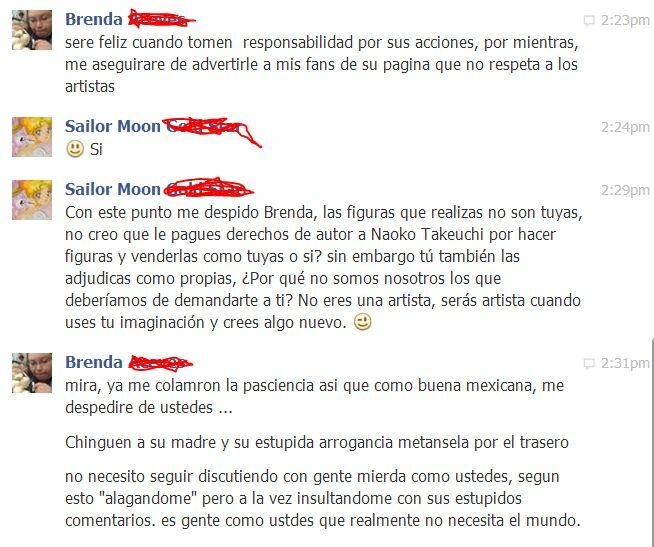 Contacte al administrador de la pagina y las force a que quitaran porque realmente me enfurecio ver como se adueñaron de mi material, eso amigos es PLAGIO desde el momento que modificas el arte original de alguien. No porque te encuentres fotos en internet al azar puedes bajarlas y tomarlas como tuyas, todo tiene su dueño y un lugar de donde vino, no tienes el derecho de nomas agarrarlas por que si, no es excusa porque al hacer una busqueda en internet toda imagen se puede saber de donde vino con solo darle click en “visitar pagina” que viene a lado derecho, asi que es imposible no saber de donde vino, menos cuando la maldita url esta visible en la maldita imagen. 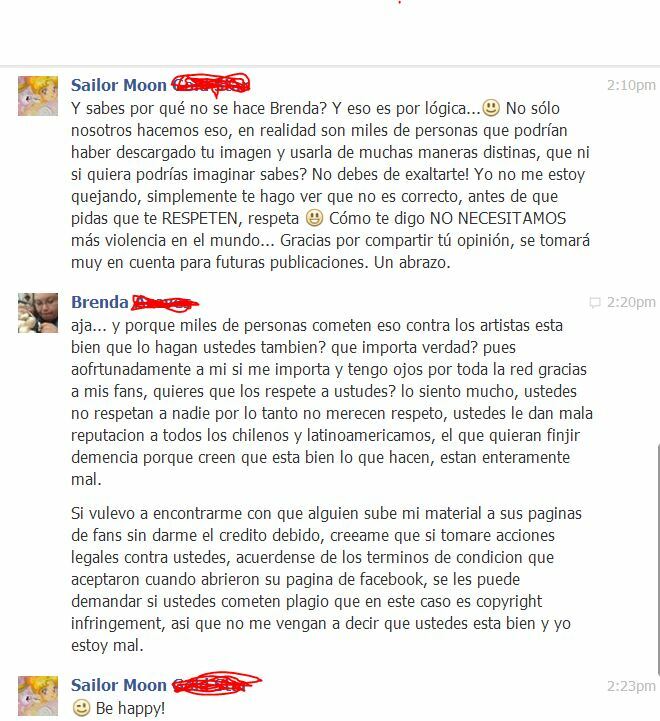 Estoy realmente enfurecida porque una pagina chilena de fans de Sailor Moon en Facebook creyo que podia tomar mis imagenes y pegarles su logo sin mi permiso, una de las administradoras tuvo la descencia de quitar mis fotos, pero otro administrador y no se quien es desafortunadamente, decidio empezar una pelea conmigo, nomas para que vean el tipo de gente que maneja esta pagina, aqui esta la conversacion que tuvimos que termino en una mentada de madre de mi parte a ellos. No quieren que piense mal de los chilenos, pero viendo como me respondieron y como me insultaron con sus mensajes, pueden ver porque estoy realmente enfurecida con todos ellos y no es la primera vez que pasa que me encuentro con chilenos y todos me insultan porque les gusta hacerlo, no voy a poner que pagina de estas personas mierdas porque no necesitan publicidad ya que no respetan a los artistas que hacen cosplay, fanart o artistas como yo. Todavia que toman mi trabajo… me insultan? en que mundo vivimos enserio. 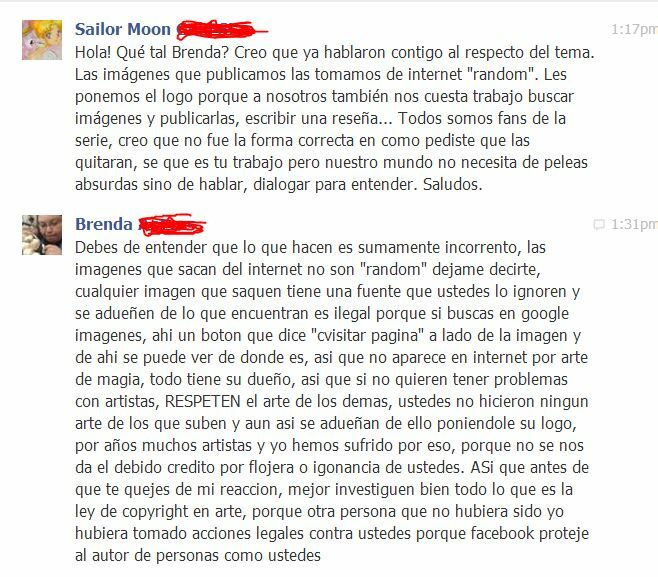 Asi a mis seguidores que encuentren imagenes mias en la web, modificadas o que no se me de credito con link, por favor reportenlo y avisenme lo antes posible para tomar accion. Por lo que solo dire esto una vez, sobre todo a los latinoamericanos, donde yo me encuentre mis imagenes manejadas por cualquier persona o pagina sin autorizacion previa TOMARE ACCIONES LEGALES CONTRA ESA PERSONA O PERSONAS.